Removal proceedings began. The government wanted Yaderlin to leave the U.S. and seek her visa in the Dominican Republic. Of course with her husband missing and without his support, she could not hope to return to the U.S. What’s more, after departing the U.S., she would be barred for 10 years from applying. Her prospects seemed hopeless. Yaderlin’s difficult situation gained national attention soon after Alex’s disappearance. An immigration judge put a temporary stop to the proceedings, and high-ranking government officials took notice. Eventually, the Department of Homeland Security exercised its authority to grant “discretionary parole” to Yaderlin. With this measure in place, she was eligible to adjust status to permanent resident despite her unlawful entry. Within days Yaderlin was able to acquire her green card. She would be guaranteed the right to live in the United States. However, Yaderlin’s good fortune was tarnished by even more devastating news. 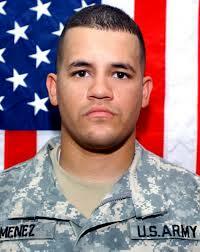 On July 8, 2008, soldiers in Iraq recovered Alex’s skeletal remains and those of Pfc. Byron Fouty who was abducted in the same attack. Jimenez was a 25-year-old specialist when he was captured; he was promoted to sergeant during his disappearance. His tragic death brought additional attention to the highly criticized policy of separating families in the deportation process. However, his circumstances may have helped to accelerate changes at least for undocumented family members of U.S. citizens in the military. In November 2013, USCIS issued a memorandum which outlined a new policy known as Parole in Place. The discretionary guidelines enable immediate relatives of U.S. citizen members of the U.S. military (current or past) who entered the U.S. without lawful status to be granted Parole in Place by USCIS.